The German government has developed a high-tech strategy called “Industry 4.0”, which shifts the industrial technology paradigm by adopting the key technologies: cyber-physical-systems, internet of things, services and people as the basis. This shift aims to interconnect human and the cyber-physical systems (i.e., machines, hardware, software), and also to allow them to communicate via internet of things or services. However, these cyber-physical-systems are generally developed by different vendors. Therefore, they might have various structures, formats, and vocabularies for exchanging the information, and since the human stakeholders might have different knowledge background, the interoperability problems among the systems and these stakeholders might arise. Each node in the internet of things provides data and is accessible via the internet. In our world, it can be imagined that there will be billions of such nodes. However, not all data provided by those nodes are useful to solve our problem. Hence, it could cause new problems that we are drowning in data, but starving for knowledge or useful information. Those big data are coming from heterogeneous sources. Ensuring the quality of those data, whether they are in a consistent form and able to fulfill the requirements of the applications using them, will be another challenge. Meanwhile the increase in energy and resource force all sectors to focus on energy and resource efficiency. A common approach to improve the energy and resource efficiency in an organization is the energy and resource management system which defines all processes and measures to ensure minimal energy and resource consumption based on given requirements, involving organization, information structure, and tools. However, most of the organizations have problems in implementing them due to the distributed and unstructured energy- and resource-related information and interoperability issues due to the trans-disciplinary nature of the processes and measures. Information and communication technology (ICT) plays a major role in supporting energy and resource management in an organization. This approach represents the knowledge/information model as the integration element of heterogeneous schema and data sources. A W3C standard, called The OWL (Web Ontology Language), is used as the model representation which serves as a shared vocabulary and schema among the heterogeneous systems and human . Ontology allows conceptualization and formalization of human knowledge elements thus it creates an inter human-machine understandable model. OWL ontologies provide flexibilities to express logical statements through the ability to depict description logic and the possible integration of rules . Therefore, logical reasoning is also possible in the knowledge model  . Different ontologies enriched with databases forming linked data allow a flexible and efficient query/search of information from various domains that is already semantically linked and also allow flexible structuring and representation of search/query results. 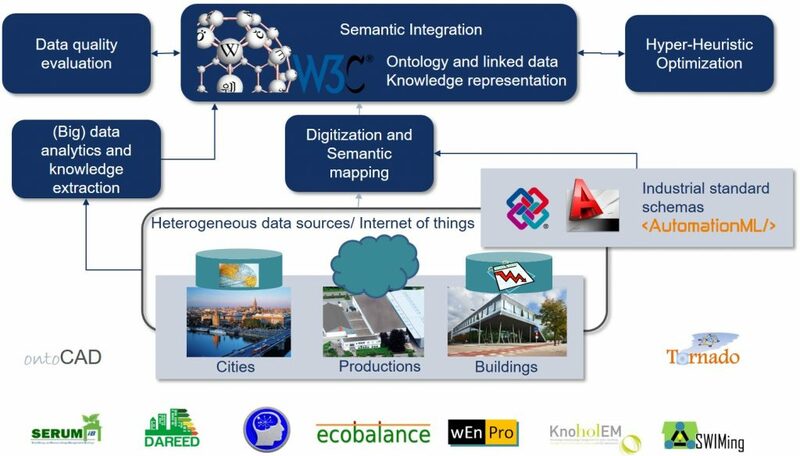 It aims to extract the semantics of existing industrial data exchange schemas and formats, such as IFC, AutomationML, and CAD, in order to align them with the schema of the developed and reused ontologies. The technologies that can be useful for this approach are for example ifc2owl and OntoCAD , which we have also involved in the community and their development. In many use cases, the single industrial data exchange standard cannot fully fulfill the data requirements of an application. Meanwhile, there are growing initiatives and recommendations on sharing data and schemas from different domains on the internet (open data). We developed methods of linked data to reuse and interlink available data and schemas that are able to fulfill data requirements of an application driven by use cases   . The method shifts the approach to address interoperability issues from data exchange to data sharing. Machine learning techniques, such as regression, association analysis, decision-tree based classification, artificial neural network, and clustering, is an artificial intelligence approach to identify interesting patterns and dependencies in a collection of data. The information or knowledge needed to solve certain problems are extracted, converted into ontology elements or rules , integrated into formalized human knowledge, and then stored in the ontology knowledge base . My research develops machine learning based techniques to solve problems in engineering and business, for instance, to predict the energy consumption of processes, to detect the energy wasting, to give recommendations for energy saving, to give recommendations for optimal factory and product configuration, etc.   . The data quality evaluation works based on an ontology model comprising (1) the semantic elements in the ontology needed by data consuming applications; (2) data sources and (3) the quality criteria, e.g. availability, format correctness, etc. By measuring the consistencies of each criterion on data sources against the requirements, the quality of the consumed data can be evaluated. This approach has also been implemented as a software framework  . The approaches described above have been applied in different domains, for example to make product configuration match customers’ needs  in the DIALOG project, to improve resource and energy efficiency in buildings , [4-7], [10-11] in the KEHL, KnoHolEM, SERUM, and SWIMing projects, to improve resource and energy efficiency in production    in WertProNET, wEnPro and ecoBalance projects, and to improve energy efficiency and to create business model in smart city context   in DAREED project. We developed energy and resource assessment models, which are represented with ontology since they involve different entities and processes within an organization that might have interoperability problems, e.g. machines, human stakeholders, buildings, organization units, etc., and diverse influencing variables. Assessment figures (EnPI) are calculated to evaluate the energy and resource efficiency of different processes and units within an organization [14-15]. This will be extended to a higher level, i.e. the whole value chain, and to a lower level, i.e. machine/tools level. Hyper-heuristic and meta-heuristic optimization methods to optimize the resource and energy consumption, especially in production, have been developed upon the ontology model . The hyper-heuristic methods use the assessment figures for the objectives parameters of the optimization model . Figure 2 depict the application of the research approach in production that has been validated in several manufacturing SMEs .